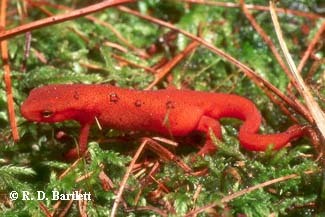 Eastern newts have three distinct life stages; aquatic larva, terrestrial juvenile (referred to as an eft or red eft), and aquatic adult. The adults range from greenish-brown to yellowish-brown above. Depending on regional variety, there may be rows of spots or incomplete stripes of bright red enclosed by black borders along either side of the body. The belly is lighter than the back and is yellow to orange. The entire body is covered with small black speckling. Males can be distinguished during the breeding season by a swollen cloaca, higher tail fin, and rough, black tubercles on the inner thighs and feet of the rear legs. Males also have wider back legs and a yellowish gland on the posterior portion of the cloaca. The small (2-8 cm), terrestrial efts range in color from reddish-brown to orange to bright crimson and also have the red spots and black speckling. 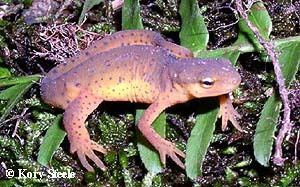 Four regional varieties (or races) of the eastern newt exist. Studies of DNA indicate that these varieties are not true subspecies, as there is very little genetic divergence among them. 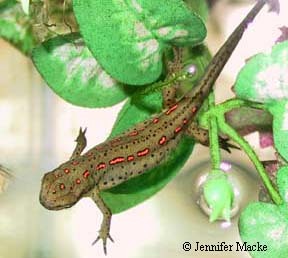 Notophthalmus viridescens viridescens: Adults of the red-spotted newt have a row of red spots enclosed by black rings along both sides of the body. This is the largest variety with adults capable of reaching a maximum of 14 cm in length. The efts of this form tend to be the brightest of all the varieties, particularly efts from higher elevations. This is the most common form in the pet trade and ranges from northeast Canada to the eastern Great Lakes and south through the Appalachians to Mississippi, Alabama, and Georgia. N. v. viridescens adult male. Notophthalmus viridescens dorsalis: Adults of the broken-striped newt have red spots fused together to form an irregular, broken line along both sides of the body. This is the smallest form, with adults rarely exceeding 10 cm. It is probably the second most common form available in the pet trade. The efts are usually duller than those of the red-spotted newt. Sometimes the eft stage is skipped completely with larvae developing into mature adults. Adults are sometimes neotenic. 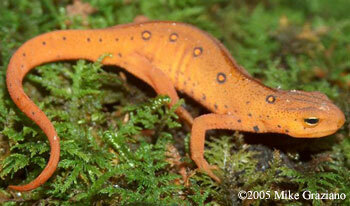 The broken-striped newt is found along the coastal plains of the Carolinas. N. v. dorsalis adult male. Notophthalmus viridescens louisianensis: The central newt is characterized by having fewer, very small spots of red or orange along the back which are incompletely ringed with black. Some individuals lack spots entirely. 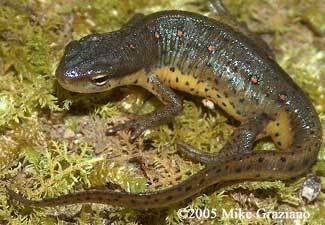 It is a slightly smaller and more slender form than the red-spotted newt with adults reaching 12 cm. The efts, when present, are uncommon and range from dull orange to dark brown. 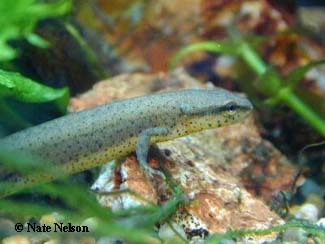 Neotenic adults are common along the gulf coastal plains and have also been found in Illinois. This newt ranges from the western Great Lakes region of Canada westward to Minnesota and Kansas and south to the Gulf Coast. N. v. louisianensis, showing typical coloration. N. v. louisianensis, showing unusual coloration. Notophthalmus viridescens piaropicola: The peninsula newt is a darker form of the eastern newt and lacks red spots entirely. Individuals range from greenish-brown to almost black and are heavily speckled with black spots. The venter may also be a deeper orange color than the typical yellow of the other forms. The eft stage is usually skipped and neoteny is frequent. This variety is only found in peninsular Florida. Eastern newts are widespread across the eastern half of North America. They range from southern Canadian Provinces to south Texas and south Florida to as far west as Oklahoma, Kansas, and Texas. Aquatic adults live in any suitable body of permanent or semi-permanent water such as ditches, ponds, sloughs, floodplains, slow-moving creeks, swamps, and marshes. 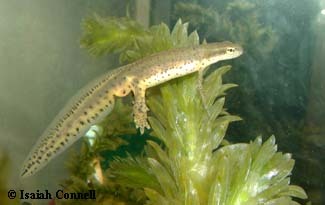 They are often abundant in fishless bodies of water with large amounts of aquatic vegetation. Bodies of water with large predatory fish are usually avoided. The terrestrial efts live in moist woodland areas adjacent to the adult habitat. 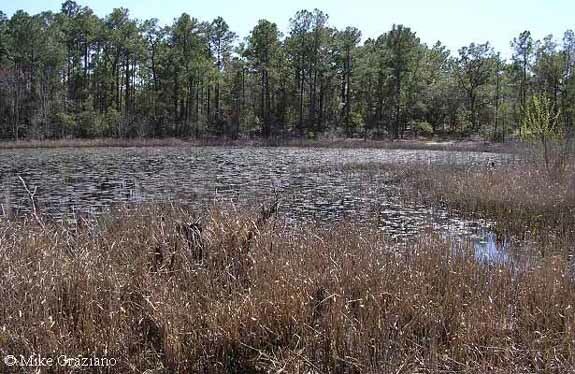 N. viridescens dorsalis habitat near the coast in North Carolina. 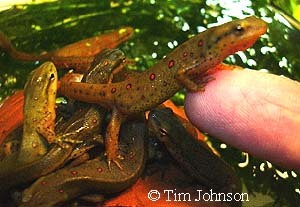 The captive requirements of these newts will depend on which life stage they are currently in. Aquatic adults will need a planted aquarium with a small land area or rocks or driftwood breaking the surface. Adults have been documented inhabiting water depths ranging from as shallow as a few centimeters to as deep as 13 meters so water depth is optional. They prefer areas of still water so aquarium filters using strong currents of water should be avoided or have their water streams diffused by objects in the tank. Temperatures are variable also and adults have been observed foraging for food under ice-covered ponds. 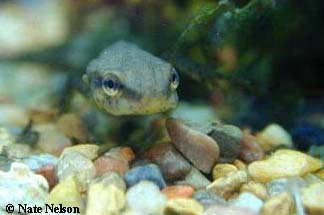 Generally, these newts will prefer a temperature between 18-23°C (60-74°F) for spring summer and reduced to around 5-10°C (40-50°F) for the winter. Adults have been noted actively foraging under ice-covered ponds throughout the winter and so one shouldn't worry much about cold temperatures unless they approach freezing. Though adults should be considered totally aquatic, in the wild some adults do leave the pond and become temporarily terrestrial if water levels drop or water temperatures become too high. It is also possible that adults occasionally leave the water for extended periods to avoid waterborne pathogens or to remove aquatic parasites such as leeches. Efts are entirely terrestrial and will require a moist woodland terrarium. As an alternative, they can be housed in simple plastic containers with a substrate of moist soil or damp paper towels that should be cleaned and misted regularly. Efts must also be kept at the temperatures described above for adults. Adults have been documented in the wild to eat worms, small amphibians and amphibian eggs, small fish, insects, arthropods, crustaceans, and other small invertebrates. In captivity, one can feed them chopped earthworms and nightcrawlers, bloodworms (alive or frozen), blackworms, and strips of beef heart. Some individuals may eat some commercial fish/amphibian pellets, though these are not recommended over the other foods described. The efts are slightly more difficult to feed because of their small size. They will require small earthworms, whiteworms, pinhead crickets, fruitflies, and very small waxworms and mealworms. Neotenic Notophthalmus v. piaropicola showing gill nubs just behind the jaw. Male N. v. louisianensis in breeding condition. Note high tail fin and black toe tips (nuptial pads). 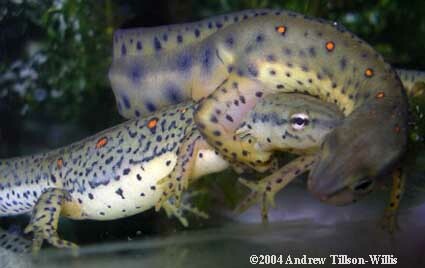 N. v. viridescens pair in amplexus. N. v. louisianensis female with newly-received spermatophore. Eastern newt courtship involves the male grasping a female in a dorsal amplexus with his wide hindlimbs. This can last for several hours. During this time, the male will rub the snout of the female with his chin and fan his tail to waft pheremones towards the female's nostrils. This behavior intensifies until finally he will release her and position himself in front of her, undulating his body. If she is receptive, she will press her snout against his tail or body and this will signal him to deposit a spermatophore, which he guides her to pick up with his body. If she is not receptive, she will take this opportunity to escape the male's advances! Amplexus often causes worry for new owners who may be unfamiliar with it. Often it appears that the female is being crushed or suffocated/drowned by the male's hindlimbs. However, there is no need to worry as the female will surface for air if she needs to with the male still on her back. Males will also accidentally amplex other males in their enthusiasm, and this can result in some irritated wrestling matches. Females can be stressed by constant amplexus. If a specific female is seen in amplexus frequently, or if she is known to be in a weakened condition, she should be removed from the male(s). Adults breed in late-winter through spring and 200-400 eggs are laid singly on aquatic vegetation. True hibernation is not required as adults from the northernmost range are active throughout winter, but if at all possible, winter water temperatures should be reduced by 10F degrees or more to help promote courtship activity. 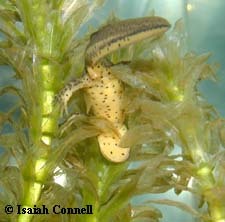 Larvae are easily cared for using the methods found in: Raising Newts from Eggs. Upon metamorphosis, the efts usually remain terrestrial for 2-3 years before eventually returning to the water as adults, though some populations may take as long as 7 years. In captivity, this time is often reduced by plentiful food. Some populations may skip the eft stage as well, so be prepared for that possibility by allowing access to water immediately after metamorphosis. N. v. viridescens aquatic adults. N. v. viridescens terrestrial adult male. Gabor, C. R. and Nice, C. C. 2004. Genetic variation among populations of Eastern Newts, Notophthalmus viridescens: A preliminary analysis based on allozymes. Herpetologica 60(3):373-386. George, C. J., Boylen, C. W., and Sheldon, R. B. 1977. The presence of the red-spotted newt Notophthalmus viridescens in waters exceeding 12 meters in Lake George, New York. Journal of Herpetology 11:87-90. Gill, D. E. 1978. The metapopulation ecology of the red-spotted newt Notophthalmus viridescens. Ecological Monographs 48:145-166. Kesler, D. H. and Mums, W. R. Jr. 1991. Diel feeding by adult red-spotted newts in the presence and absence of sunfish. Journal of Freshwater Ecology 6:267-273. MacNamara, J. A. 1977. Food habits of terrestrial adult migrants and immature red efts of the red-spotted newt Notophthalmus viridescens. Herpetologica 33:127-132. Massey, A. 1990. 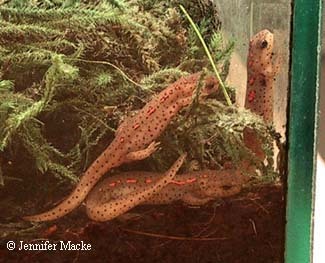 Notes on the reproductive ecology of red-spotted newts Notophthalmus viridescens. Journal of Herpetology 24:106-107. Mecham, J. S. 1967. Notophthalmus viridescens. Catalogue of American Amphibians and Reptiles, pp. 53.1-53.4. Petranka, J. W. 1998, Salamanders of the United States and Canada, Smithsonian Institute Press, Washington. ©2001 Nate Nelson. Revised by Nate Nelson 2004.